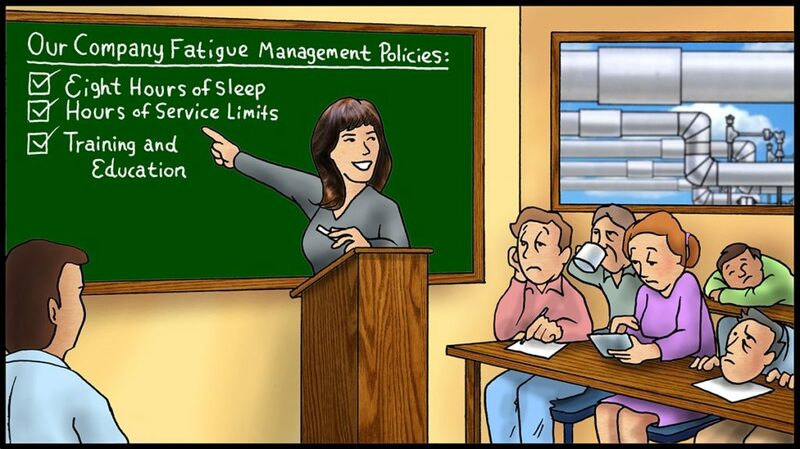 One of the subjects that are supposed to be covered in fatigue management training for controllers and their supervisors is a company’s own fatigue management policies and procedures. As I travel from control room to control room, I ask controllers about those policies and procedures. Often, all I get is a blank look. That is puzzling since the fatigue management procedures are designed to reduce the risks of a controller being involved in a fatigue related incident. Establish a maximum limit on controller hours of service, which may allow for an emergency deviation. Educate controllers and supervisors in fatigue mitigation strategies and how off-duty activities contribute to fatigue. Train controllers and supervisors to recognize the signs of fatigue. For items one and two, controllers need to know their schedule rotation, start and stop times, and the maximum number of hours they are allowed to work without a deviation. Companies have to develop supporting procedures and policies that affect controllers and need to ensure controllers know those procedures also. At the very least, controllers and supervisors need to read the fatigue management procedures each year. We recommend the use of a “required reading” procedure to document that all affected employees have read, understood, and signed their names with the date the reading is completed. This is not as effective as providing an opportunity for a group discussion and review. What is your company’s practice? For items three and four, a fatigue education and training program has to cover fatigue mitigation strategies for its particular operations, how off-duty activities contribute to fatigue, and how to recognize the signs of fatigue. Companies are using a multitude of methods for fatigue training and education. Those methods vary from a brief PowerPoint presentation to online training to classroom sessions to providing reading material about fatigue management. Some of those methods do not cover the 20 subjects listed in the CRM inspection guidance. Does your fatigue training and education program cover all of those subjects? One of the reasons we have provided over 84 monthly articles and seven annual calendars is to provide ongoing and regular educational materials on those 20 subjects. Occasionally, someone even lets us know the articles and calendars are useful. Here’s an example: Good day Mr. Alday I have just finished your recent article on good nutrition and appreciate the reminder on good or better habits. Thanks again for the fatigue and nutrition articles, they are a great reminder to keep focused. Make sure your employees are provided training on your company’s fatigue management policies and procedures including their intent, their content, anything in the policies that cause discontent, and what the policies are designed to prevent. If you have any feedback on our articles or any of our services, please let me know.